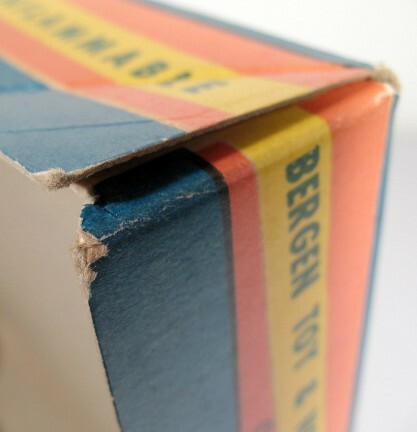 This Beton boxed set is in exceptionally fine condition. Even the original insert and rubber bands are present and holding the pieces firmly in place. 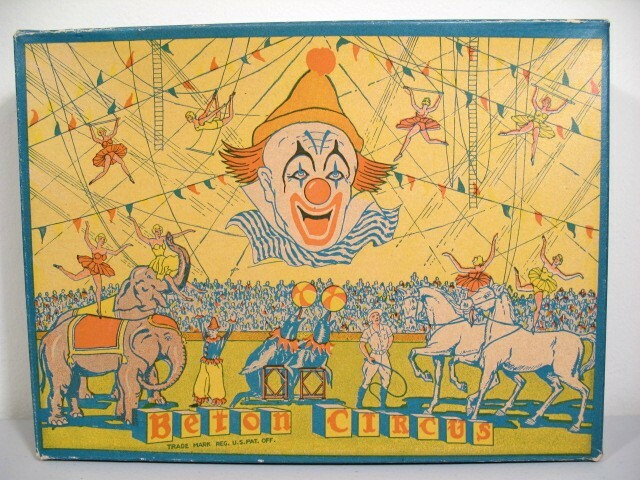 In all likelihood, the clown, trainer, and animals have never been removed from the box, and their paint is flawless. 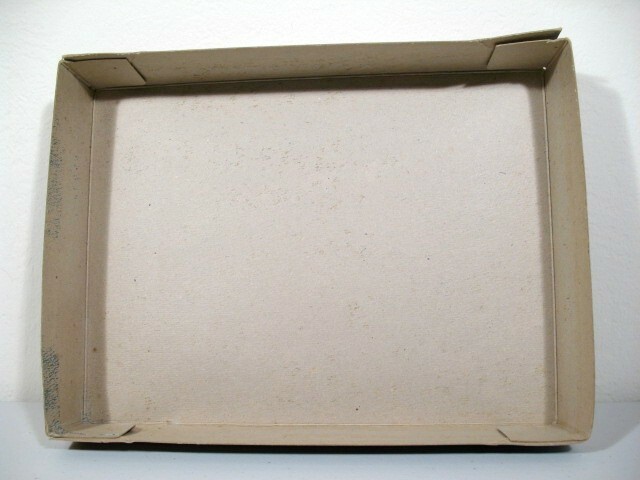 Below are additional photos showing the condition of the box’s bottom and cover. One corner of the cover is separated, and there is very minor wear on the edges, but the illustration remains bright and beautiful. 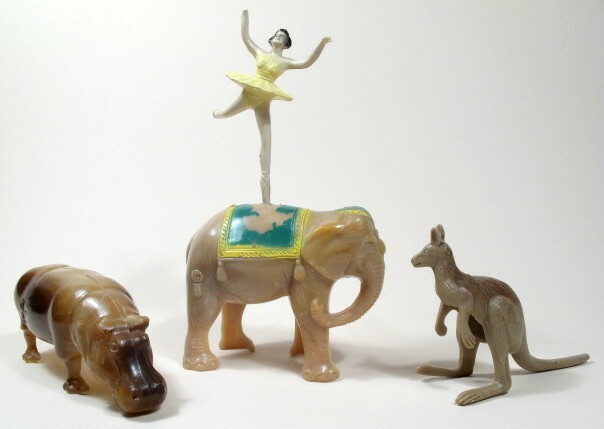 include female circus performers who balance atop horses, and none that ride elephants. Color is Beton’s strong suit. 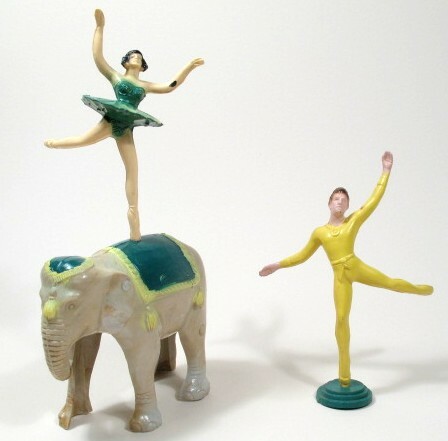 Here, chrome yellow and kelly green contrast with a light brown, faintly marbled elephant. 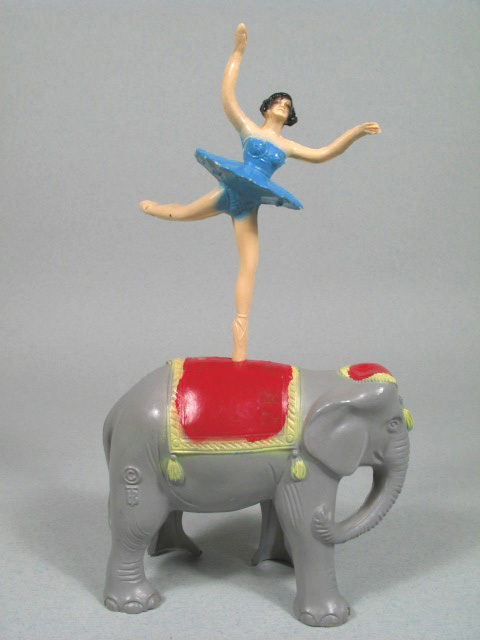 The male dancer balances on a circular stand - very hard to find in a dark color. 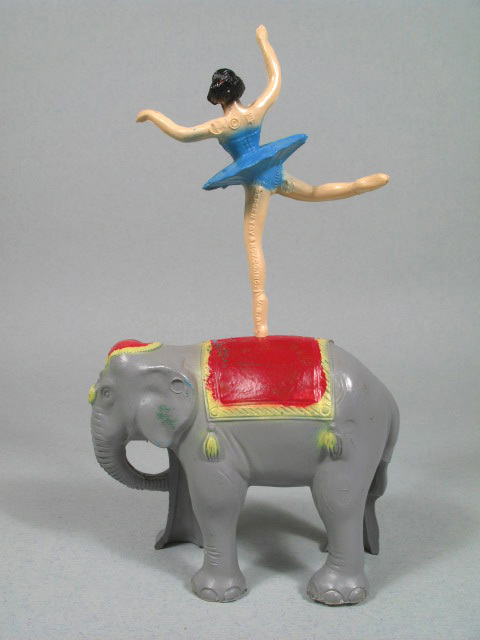 Turquoise and powder pink trappings adorn this rich brown elephant, and the red-haired rider wears a tutu to match. Fitting a dancer to an animal partner can be difficult. 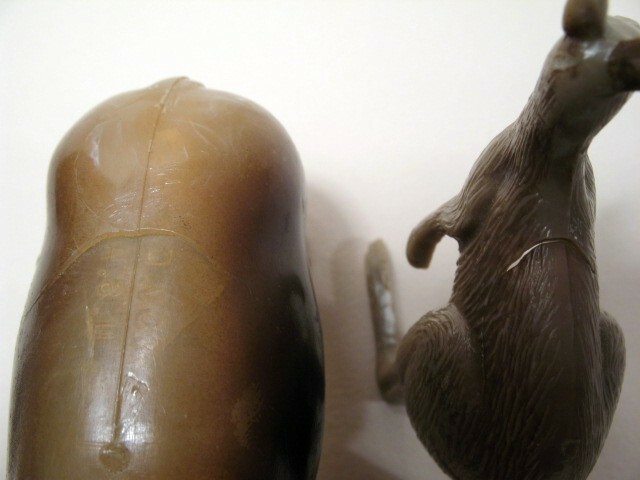 The slender, elongated left toe is often mismolded. If too thick, it won’t go into the hole drilled into the animal’s back at all. If the toe is too thin, the figure teeters and falls. A lovely soft medium gray elephant wears bright red trappings trimmed with yellow. 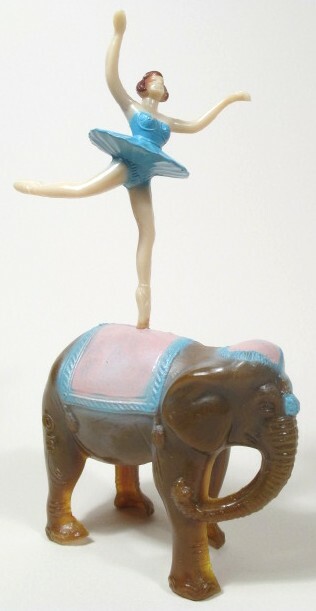 Poised on her sturdy back is a raven-haired dancer in a sky-blue dress. The red blanket shows a few thin smudges of blue, which made it to her left ear as well. Imagine . 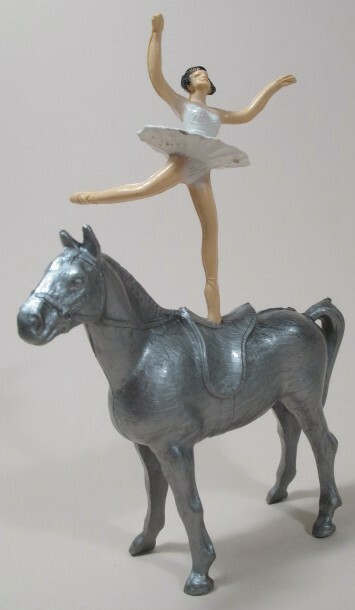 . . in a costume of swan feathers, the dancer flies in graceful circuits of center ring, atop a gleaming silver steed. Who could pick a favorite from this array of Beton colors? Ponylope loves them all! Left to right: Deep pink, black, pale pink, lime green, rose pink, buttercup, lilac, turquoise. 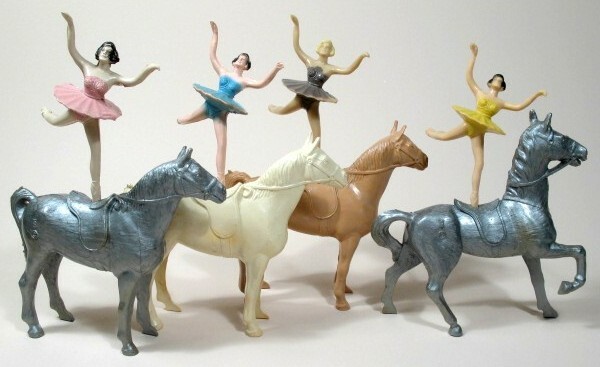 Each poses on a plastic three-tiered stand. 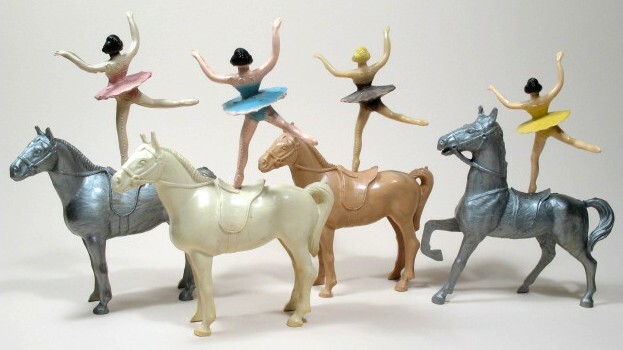 The male dancer is absolutely unique in the playset world! Left to right: Red, black medium blue, aqua, dark blue, yellow, kelly green. Plastic three-tiered stand included. Baggy pantaloons, ruffles, oversize buttons, conical hat - enter the classic circus clown! For some reason, it’s not uncommon for this figure to lean forward or back (note the guy on the far right). Or to become comically tubby when the mold gets overfilled. Left to right: Rust, marbled red/gray, red, brown, marbled dark gray, rust. Somebody at Bergen Toy really liked this guy, he was made in so many wild colors that are hard to describe! TOP ROW A Marbled brown/red/gray with separated whip, B medium blue, C pale blue with traces of non-factory paint or glue, D chartreuse, E marbled violet/red, F pale gray-brown with white helmet, G green. BOTTOM ROW A Cobalt blue, B teal blue, C mint green, D red, E marbled brown/red/cream, F opalescent silver/green/pink, G olive gray. Painting stripes freehand, on an assembly line, makes for interesting patterns! 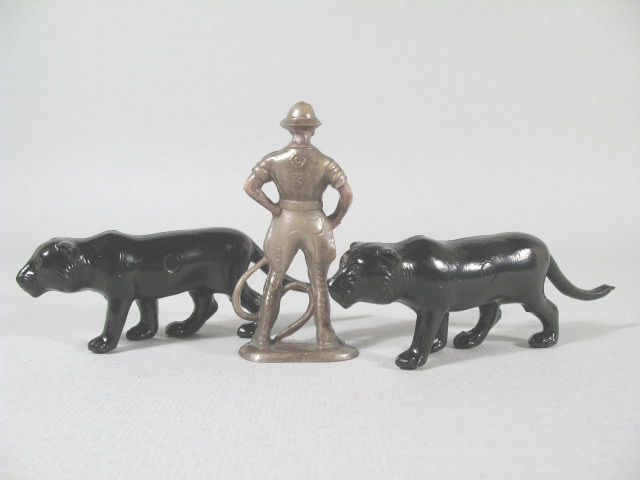 Here are three tigers in different base plastic colors with contrasting, rather impressionistic, stripes. overtones of pink and sky blue. Superb condition. Three shiny black seals have just emerged from their pool on command. Could the marbled blue at the trainer’s feet be a splash of water from overly enthusiastic pinnipeds? 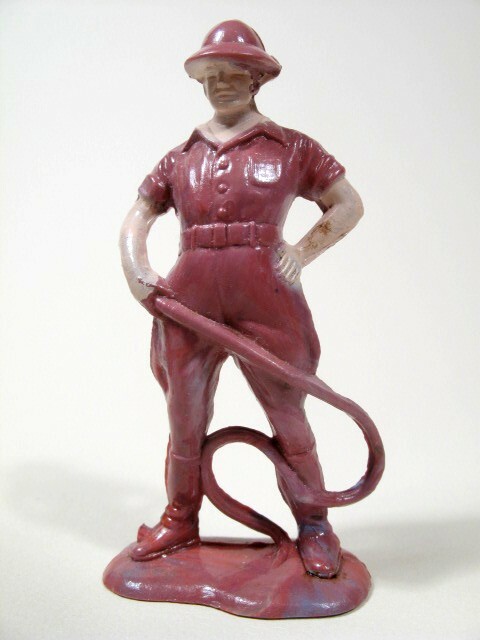 Veterans of expositions past, these figures are looking for an honorable retirement. 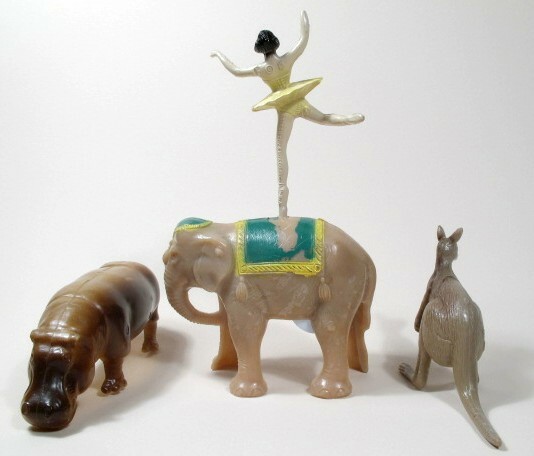 The dancer has lost a hand, the elephant’s saddle is peeling, and the hippo and ‘roo both have a crack on their back (see photo 3). 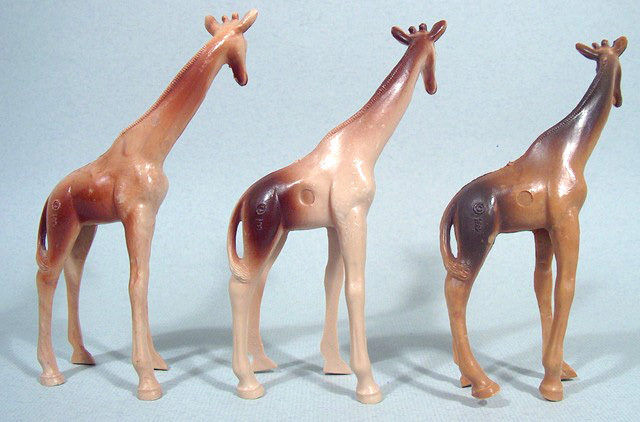 Three camels in more usual Beton plastic colors, with overpainting in contrasting colors. All excellent. 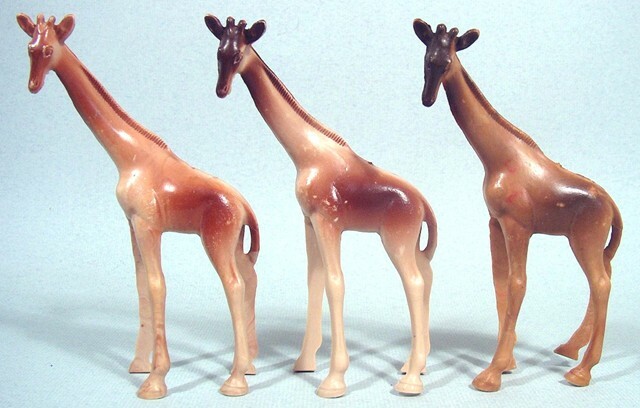 Four rhinos in beautiful condition..
Three sweet giraffes. Note that the one at far right has warped legs. It still stands fine. Three hippos. The guy at the right has paint loss. 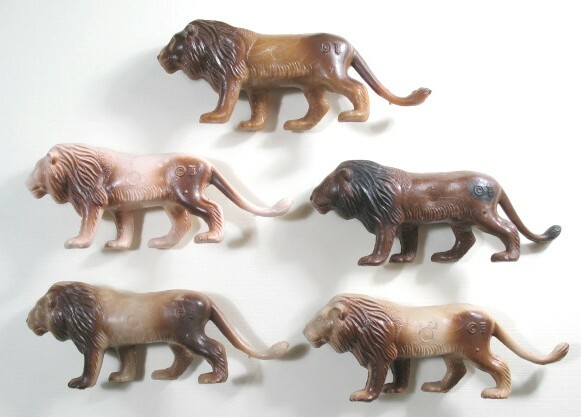 Five male lions in a variety of plastic base colors and overpainted accent shades. All in excellent condition. Beton calls this pose a tiger, but many were molded in solid colors with no stripes. 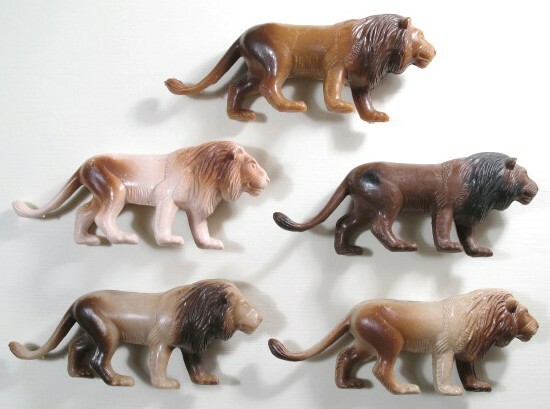 The brown animal at the left would work just as well as a female lion. Mate it with a male from the above group! A second group of big cats. Of course, a black “tiger” does double duty as a sleek panther. All are in very good condition. The yellow animal has a mark as shown that is an inclusion in the plastic, and there is another such mark on the inside back leg. The blue has light wear on the left front foot. 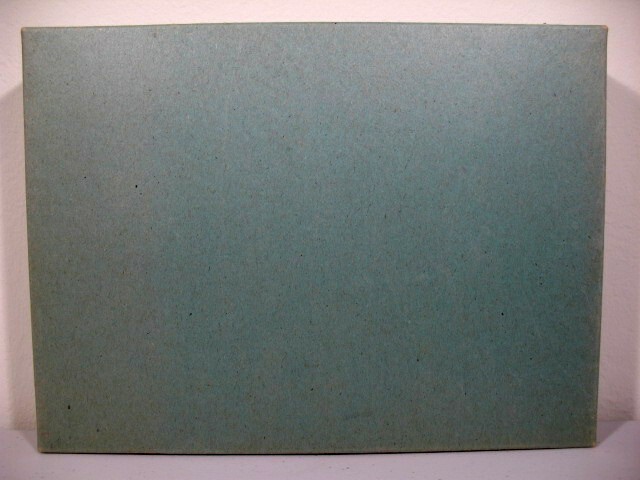 The green buffalo is excellent; the blue has wear and some discoloration (opposite side). Very good condition, with a little extra plastic on the right hip, where they were ejected from the mold. 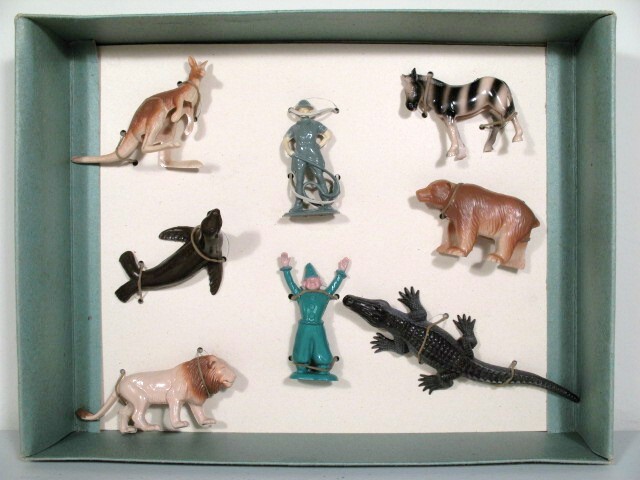 These animals all have at least a touch of mold flashing on the antlers. It can easily be pruned. Though they are survivors all, these animals have some scars to show. The lions were marked on the bottoms of their feet, and the color bled. The tiger lost its tail, and the croc had his tail chewed.